Good morning friends! While I was at my in-laws place on Wednesday I came across and article on Facebook about cats. As I am a huge fan of cats, I naturally decided to check it out. The article was about how cats sit in circles. A man noticed that his cat liked to sit in the middle of a loop made by a power cord on the floor. 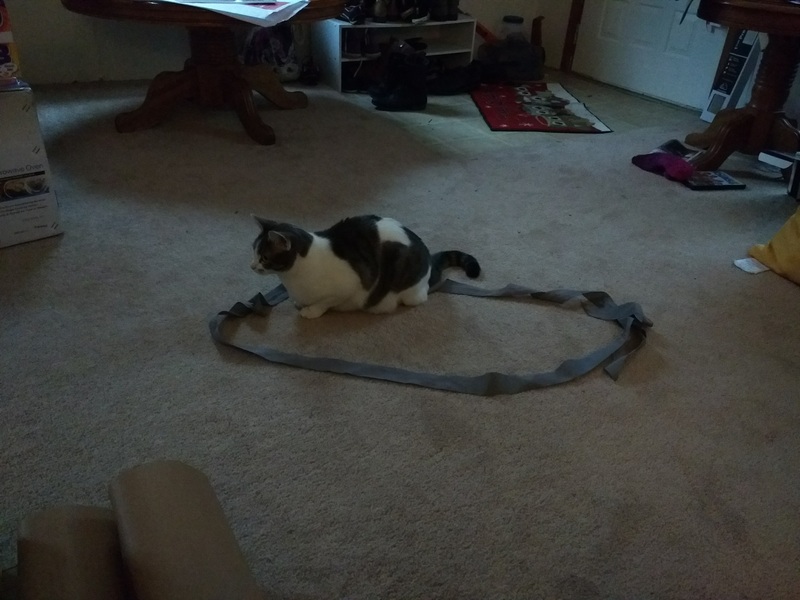 Curious, he decided to try taping a circle on the floor to see if it was the shape that attracted the cat, or just something about that spot. His cat, a very pretty long haired cat, sat in the middle of the taped circle. He tried it with another circle and it worked the same way. 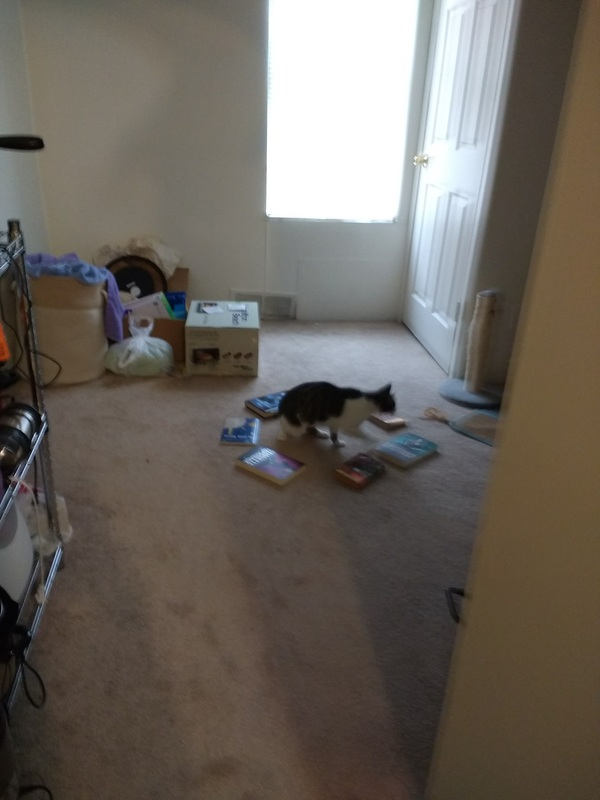 This man put his findings on the internet, according the the article, and soon lots of cat owners were making circles on their floors for their cats to sit in. And they all worked. Lots of cats sat in lots of different circles, and some squares. The article explained that scientist theorize that the circle creates the illusion of a closed in space that makes the cat feel safe and that’s why they like to sit in the middle of it. Makes sense, I guess. Cats do like closed in spaces for snuggles and naps. So I decided to give this fun little experiment a try. My first obstacle was the fact that I don’t own proper tape. No masking tape or painters tape, just duck tape, which seems excessive, and clear tape, which seems a little sneaky for this purpose. So I had to find some other way to make a circle for my cats to sit in. 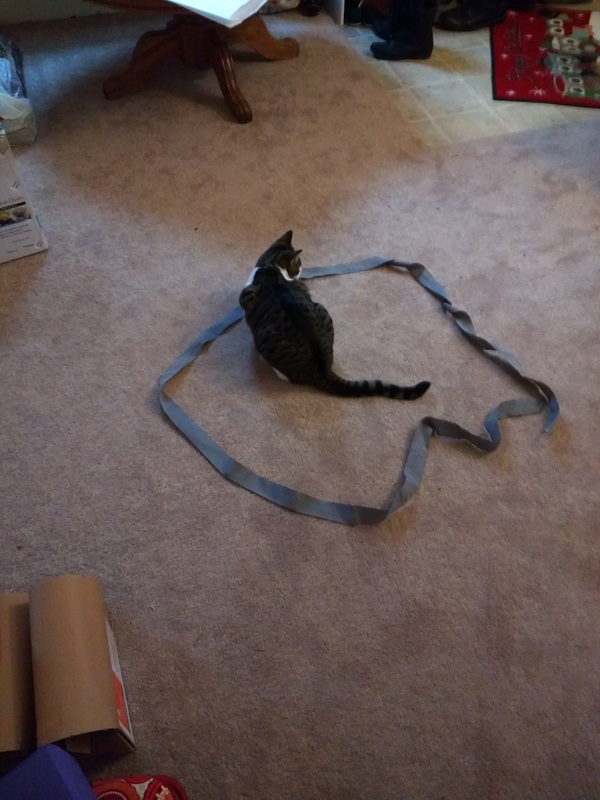 There is a very long ribbon that my cats play with which seemed to be my best bet. I was afraid, however, that they would just play with it instead of sitting in it. I was right. Calamity attacked it immediately on sight. She was technically in the circle, but not sitting pretty like the other cats. Mostly she was playing with the ribbon ends. Pearly did lay in it for a while, but I think it was a fluke. I’m sure she’d been chewing on the ribbon and got distracted. So my next idea was a circle made of other things. Some of the pictures in the article were of cats sitting in the middle of a ring of objects. 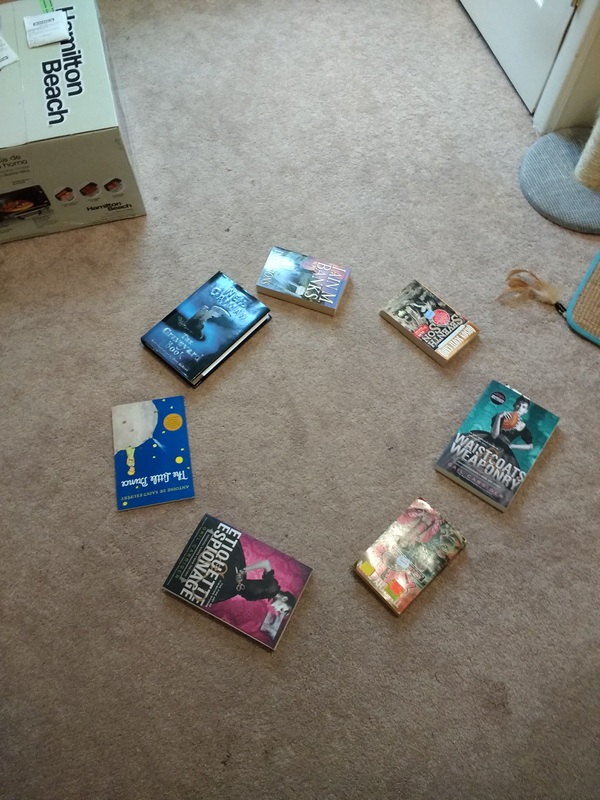 I have lots of books, so I grabbed a bunch and made a nice circle out of them in the hall and walked away, hoping if I wasn’t watching them my girls wouldn’t feel self-conscious about sitting in the middle of it. They tend to want to be near me if I’m around, especially when I’m in the kitchen. Kitchen is the food place, after all. This circle came with about the same amount of success. Pearl sniffed the circle and then sat beside it. Calamity sat inside it for a little while I was reheating my lunch, but decided to move before I could get a good picture of her sitting pretty. Since then the circles have remained un-sat-in. The ribbon circle is no more, destroyed by the playful paws of the kittens who were supposed to sit in it. The book circle is still in the hall, slightly disturbing my husband. He told me this morning that it looks like I was trying to summon a literary demon or something. To the best of my knowledge, my girls have not bothered to sit in it, despite my constant urging. My cats just don’t like circles. I suppose I shouldn’t really call this a failed cat experiment. After all, as Mythbusters has told me time and time again, failure is always an option. I was disappointed, though, that my cats didn’t want to sit in the circles I made for them. My husband was greatly amused by how bitter I was towards them for not sitting in my circles. But really, how cute would it have been if they had got to the middle and sat there all pretty? 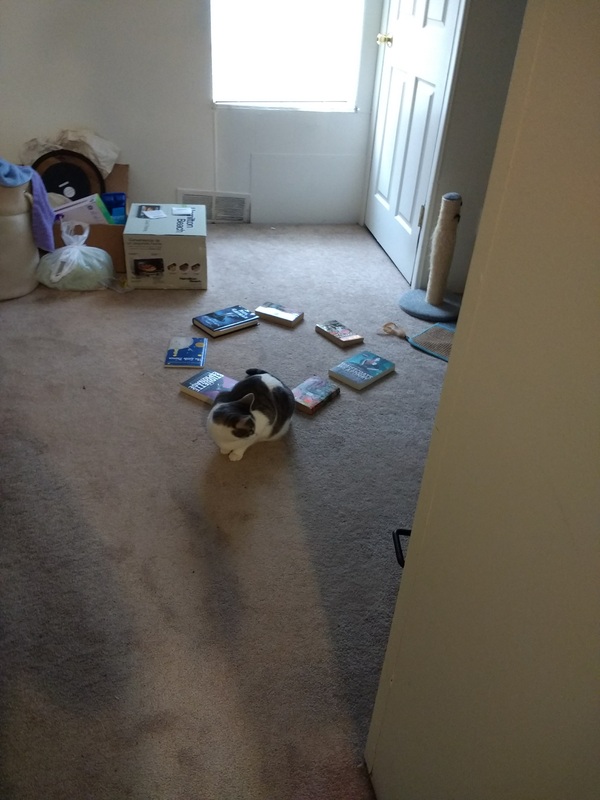 Maybe I’ll get some masking tape and try again some time, but I have a feeling my cats just don’t have the sitting in circles instinct. They are special cats, but I love them. You should try this with your cats at home and let me know if your experiments go better than mine did. In the mean time, have a lovely day, my friends.